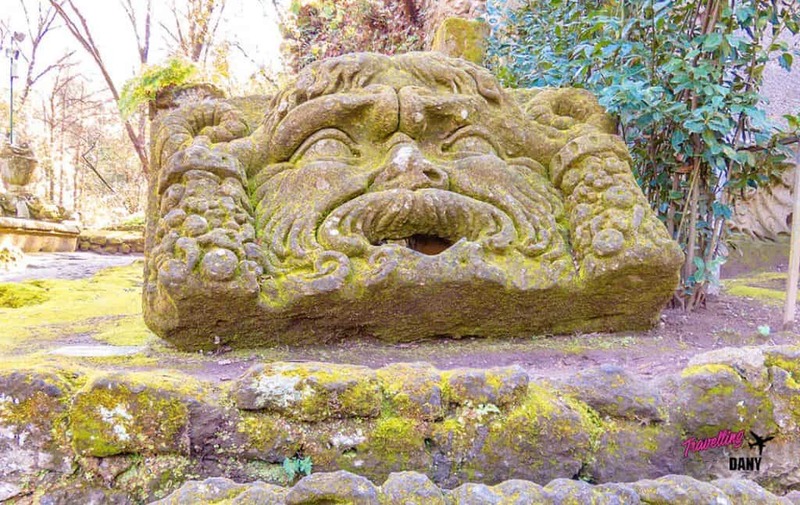 What’s the meaning behind the grotesque statues at Bomarzo Gardens? Is this really one of the most haunted places in Italy? Where’s the Bomarzo Monster Park? 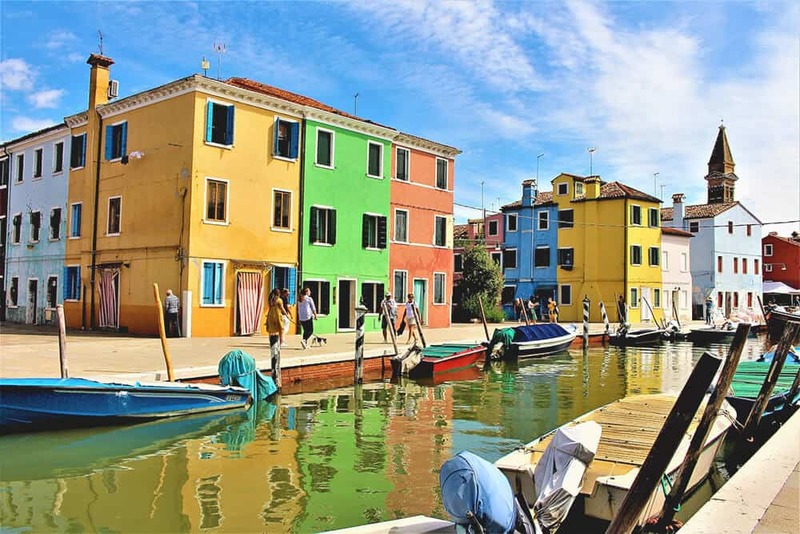 Are you planning a trip to Italy and yet the huge crowds (and sometimes the huge prices) scare you a little? 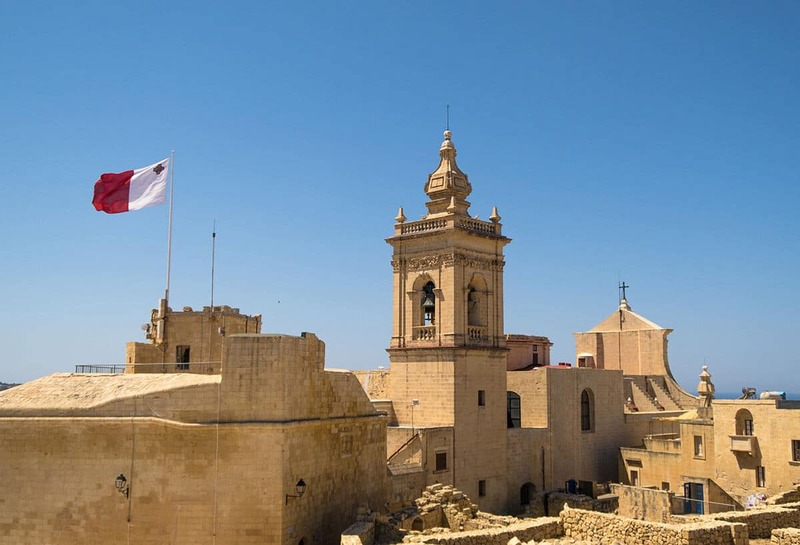 If you’ve read a bit about our Country, you’ll know that the best landmarks in Italy are generally to be found off the beaten path, away from the mass tourism. So let me introduce you to the Bomarzo Monster Park, also known here as the Sacred Grove. 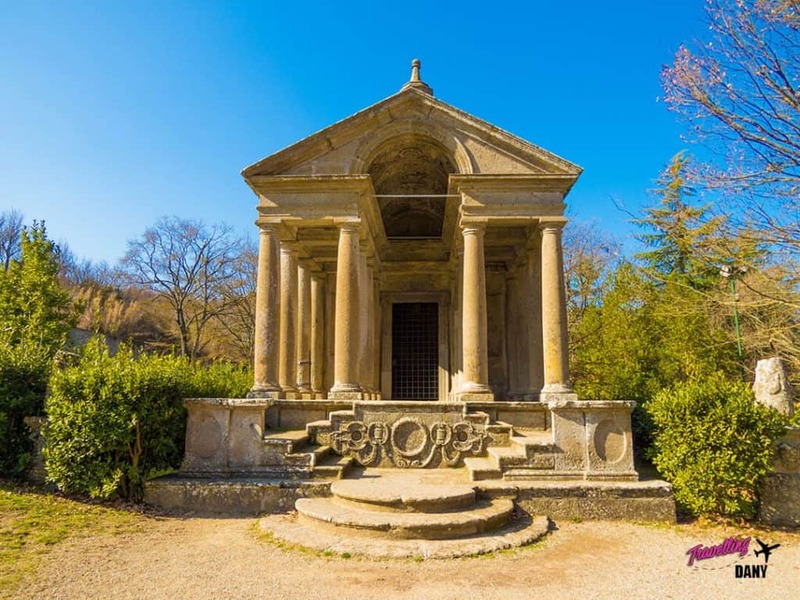 One of our hidden gems, and a place that historians still don’t fully understand, the Bomarzo Park is also one of the most haunted places in Italy! You aren’t afraid of ghosts, right? The Bomarzo Monster Park was designed by the architect Pirro Ligorio (the one who completed St. Peter’s Basilica in Vatican City after the death of Michelangelo), on a commission from Prince Pier Francesco Orsini (also known as Vicino Orsini). It dates back to 1552: Prince planned everything in the span of 25 years. After the death of his beloved wife, Giulia Farnese, in fact, Vicino Orsini decided to drown his sorrows into an intensive and long period to study the classics. The result has become over the years one of the weirdest landmarks in Italy: a hidden gem not many people know about. So much so that even the Spanish painter Salvador Dali said that the Bomarzo Park was one of the most unique places he’d ever visited. Vicino Orsini decided to dedicate the Sacred Grove, as he named this park, to his wife, but he never really shared with anyone the true meaning behind all the weird and grotesque statues scattered in this park. Each one of the statues has been carved from huge blocks of stone that were already in the valley. The stone turned into scary beasts, heroes, sirens or weird and uneven buildings. According to a few historians, only his death stopped Prince Pier Francesco Orsini to keep turning every rock in the valley into yet another sculpture for his monumental garden. Scientists and historians have tried several times to understand the hidden meaning in this labyrinth, interpreting the symbols scattered through the Bomarzo Monster Park in several ways. They found ancient themes, lines from Renaissance literature, and classical buildings that don’t follow the rules of perspective, probably aiming to confuse the visitors. The result is that while they could guess many things, this is one of the landmarks in Italy that still remains a mystery. It doesn’t help that many of the inscriptions are too ruined to be read, due to a long period of oblivion. The park was in fact bought by the Bettini family only in the XXth century and many of the big statues were moved from their original position, making it impossible to understand if there was some kind of story to be told. Although we still don’t know why the Prince built the Bomarzo Garden, some historians have guessed that it could have been planned as some kind of rite of passage that, according to the classics that Vicino Orsini loved to read, had to transform a “regular guy” into a hero. 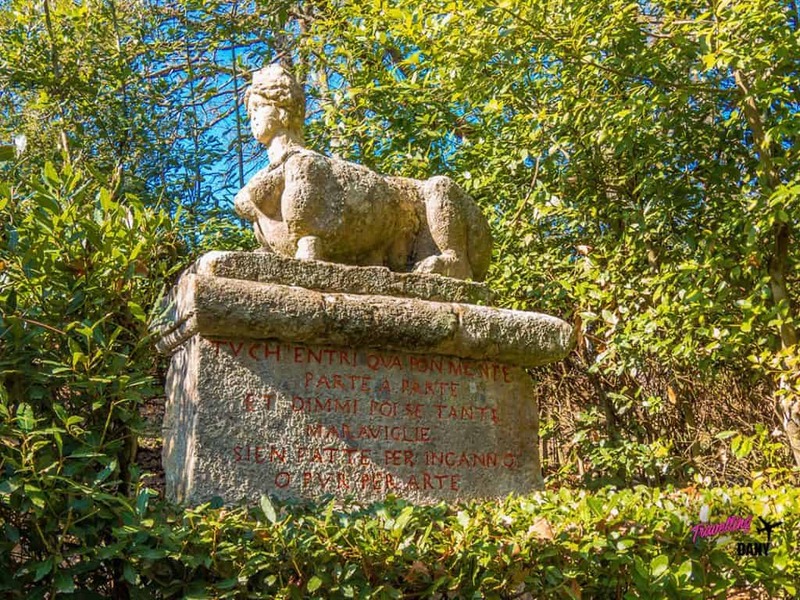 There have always been theories about the fact that the Bomarzo Monster Park is a place deeply tied to esoteric practices and human sacrifices. When a sacrificial altar was found in the deepest part of the woods, about 15 years ago, it sparkled a series of ghost sightings. The altar was built using the same stone as the statues, but it was carved with specific obscure symbols like a few sun shapes with their rays turned to the left, and has channels to let the blood flow away to some kind of drainage system. Much like the sacrificial altars in Mexico. A few historians have mentioned that there might have been a cult venerating Uranus in stead than the Sun. Because they still don’t know for sure what they were doing at the Bomarzo Garden, and if there really were human sacrifices going on, they’re not sure what to make of this. Many people believe that the Bomarzo Sacred Grove is one of the most haunted places in Italy, because many have seen the ghost of Vicino Orsini through the woods. Others claimed to have seen strange shadows, or that they have felt a sudden chill (that had nothing to do with the Italian winter weather!) while walking to the area where the sacrificial altar was. Those who believe in ghosts are sure that this place is haunted both by the Prince, who was literally obsessed by the Bomarzo Monster Park, and by the victims who died on the altar. Whatever it is, considering that the woods can be particularly spooky also during the day, because of the monster statues, no one will ever convince me to walk around the area in the pitch of the night! Entering the Bomarzo Park you will go through a nice green area where there’s even a football field for the kids who come here with their schools. Everything looks merry and bright, especially in spring. Little you’d imagine that walking through the stone gate of one of the least known landmarks in Italy… you’d get to see scary monsters and weird statues! The Sphinxes: soon after stepping through the main gate of the Sacred Grove, you will find two Sphinxes that look like the ones in Egypt (so a woman with the body of a lion). They sit on two big stone altars and they are guarding the park, welcoming the visitors with lines written in ancient Italian. Proteus (or Glaucus): Not too far away from the Sphinxes there’s the first real “monster“, known with both the names of Proteus or Glaucus. It is a huge anthropomorphic mask with its mouth wide open, that seems to be coming out straight from the dirt, with a round stone on its head, topped by a tiny castle. Hercules and Cacus: also known as the Giants’ fight. This is the biggest statue at the Bomarzo Monster Park and represents two giants fighting. Around them there might have been other soldiers, much smaller, but they have been mostly destroyed by the passing of time. The Tortoise and the Whale: not very far away from Hercules and Cacus. The two statues are a big tortoise with the goddess Nike on the top of its shell, and a scary whale with its mouth wide open that is emerging from the dirt. The statues are positioned in a way that feels like they are constantly looking at each other. The Leaning House: One of the best known buildings in this area is a small house that is leaning on one side, just like the tower of Pisa. You can walk inside and feel completely lost, because of the irregular slope. To make it simple, it feels like the inside of the house is leaning on a different side, compared to what you’ve seen on the outside. Some think that originally the entrance to the Sacred Grove was right in front of the Leaning House. Neptune and the Nymph: After visiting the Leaning House you will have to climb a few steps to a different area of the Bomarzo Gardens. There’s a big open field where huge stone jars have been scattered around. Next to them, a majestic Neptune statue, with a dolphin on his arm and a big sea creature emerging from the dirt. A few steps away from Neptune, another pretty big statue, this time a sensual Nymph, is laying down while watching the nearby God. The elephant: This statue is more than a bit macabre. It shows an elephant with a tower on its back (another esoteric symbol) holding a Roman legionary with its proboscis. Clearly it’s trying to kill the Roman soldier. According to the historians, it might refer to Hannibal Barca (nope, not talking of Hannibal Lecter), and the Punic Wars. The Drake: A scary wyvern fighting against 3 other beasts. One looks like a big feline but the statues are too ruined and aside from the wyvern it’s almost impossible to recognize the other figures. The Orc: The most famous monster in Bomarzo, that made this park one of the most unique landmarks in Italy. This big stone face with its open mouth is a tiny ritual chamber. You can step inside to see the altar (which might have been used for more obscure rituals), which is creepy enough when you see it. If you need more, try to speak inside the chamber: your voice will be amplified and distorted, becoming something straight from a horror movie. The Temple: Built about 20 years after the rest of the park, in memory of the Prince’s second wife, it looks like a mix of Classical and Renaissance styles. 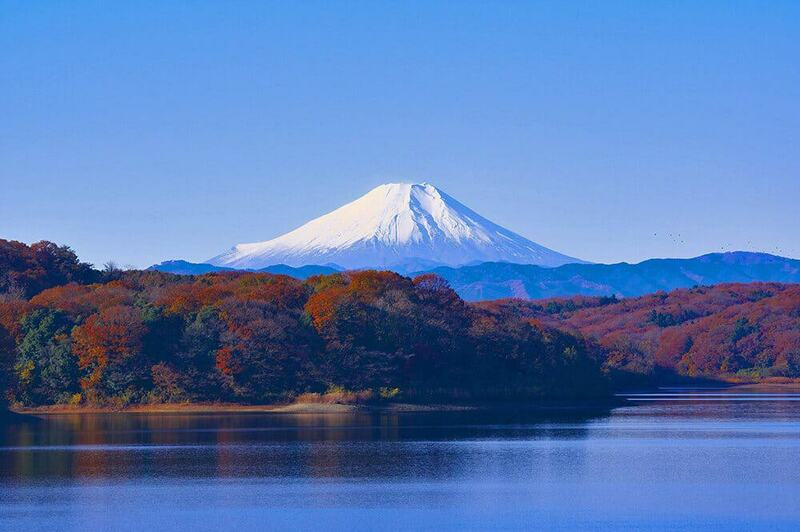 It is closed to the visitors, but many people, when the weather is good, come here to have a picnic. In front of the temple in fact there’s a green field that overlooks the nearby cities. It can be pretty crowded in the hot summer days. Tourists? Nope, they’re mostly locals! We’ve visited in Spring and we were completely alone, almost too good to be true! The park is in Lazio Region, Central Italy. It’s about one hour and half to the North of Rome. So if you are spending a few days in Rome and you want to do something a little different, exploring a mostly unknown landmark in Italy, the Sacred Grove represents the perfect day trip. It is located in an area full of Etruscan history, also known as Tuscia Viterbese, surrounded by beautiful towns. Almost like the beautiful countryside in Tuscany, and one step away from Abruzzo region. In case you are wondering, food in this area is to die for! I also have a useful guide to Italy tipping with Italian sentences if you need it! Many travel agencies in Rome or online offer the chance to book a trip to the Sacred Grove on a tour bus. Yet if you want to plan this on your own, you can hop on a train to Orte (VT) from the Tiburtina Station in Rome. Once there, you will find the Cotral buses for Viterbo that stop in Bomarzo. You can buy a bus ticket at the local bar. Mind you: the Cotral buses don’t work on Sunday. The bus ride lasts more or less 1 hour. Once you get in Bomarzo, hopefully with a city map on your phone, cut through the town. If you follow the sign to the Bomarzo Monster Park from the station you’ll in fact add +2km to your walk. It is a road intended for cars. Walking in Via del Lavatoio you will find another sign pointing to the Park, this time it’s the right one. It’s a 20 minutes walk, more or less. Now do you understand why people prefer to book a tour bus or to rent a car? If you’re roadtripping in Italy with a rented car (staying at the Hampton by Hilton hotel Rome East you won’t even have to go through the huge traffic in Rome) the road is pretty easy. Take the A1/E35 motorway to Attigliano and then you just have one straight road on the SP Bomarzese to the Monster Park. 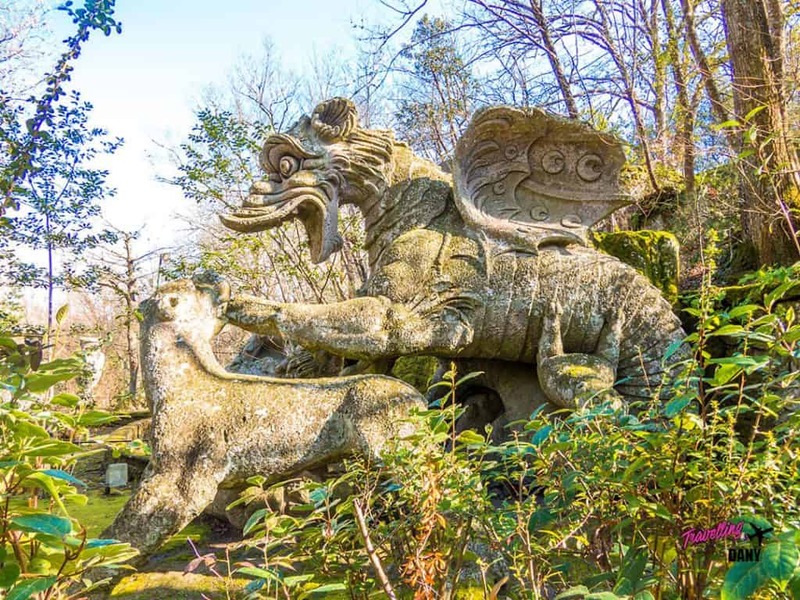 The Bomarzo Monster Park is open all year round. You can enter from 08:30am to 7:00pm from the 1st April to the 31th October. And from 8:30am to sunset from the 1st November to the 31th March. The ticket costs 10€ and can only be bought at the park. Children from 0 to 4 years won’t have to pay a ticket, while they have a reduction from 4 to 8 year, so you’ll only pay 8€. At Bomarzo Monster park there isn’t a shop so if you’re looking for souvenirs from Italy it’d be better to do so in the Tuscia Viterbese area. Beautiful, strange, mysterious. I love it. It’s beautiful, tragic and triumphant all at the same time. Somehow this reminds me of going on a caving expedition in Belize. We came across Mayan artifacts that were well preserved, but lacked proper historical placement. It was the uncertainty that was so exciting. Thanks for sharing. Absolutely! That and the fact that mass tourism still hasn’t discovered it! My goodness this sounds freaky! Fascinating to read about. I think my husband would be totally keen to see this place but I’m not so sure – and definitely not in the dark ha ha! Interesting to read about the history – at least what is known anyway. The sphinxes would be cool to see though. 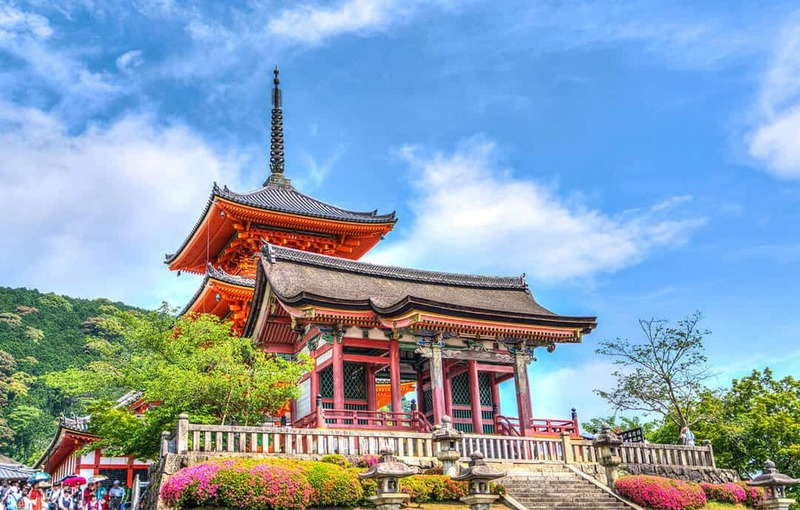 Well, Ms Dany, your post is so informative and complete that one doesn’t need to go there anymore 😉 Just kidding – your post is really informative, but at the same time it’s very inviting to visit this place that seems so unique. From your pix, I like the sphinxes and the brutal elephant best. Thanx for sharing – I appreciate the thoroughness of your writing! What a fantastic recommendation – We are planning a trip to Italy for next summer – this park looks incredible. Thanks for sharing this Dany! Wonderful! Where are you heading to, specifically? This is actually one of the places my (Italian) boyfriend has said he’d like to take me to when I complained about all the tourists in the places we usually visit… but I knew absolutely nothing about it until now, so thanks for educating me before we go! Awesome! Do you already know when you’ll visit? 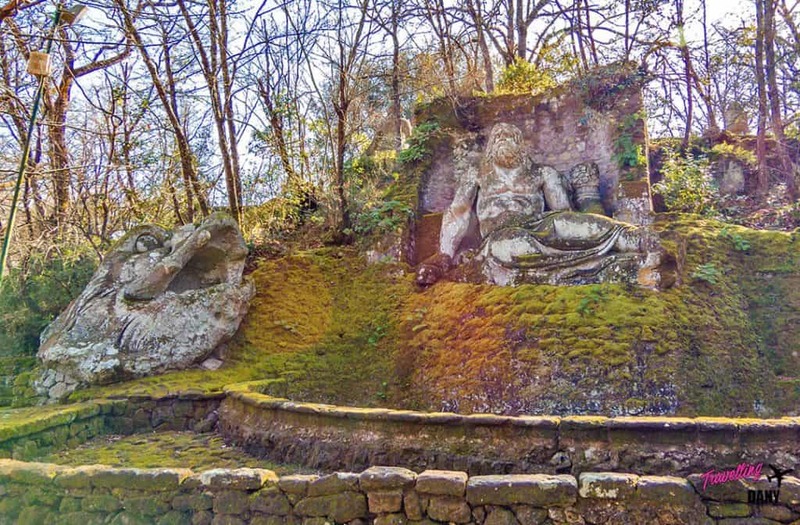 I’ve never heard of Bomarzo Monster Park, but I’m certainly intrigued by the mystery of it. The statues blend with the natural setting. We had considered a trip to Italy this summer that probably is going to be delayed, but I so want to go! Ouch! Sorry that your trip has been delayed but hopefully you get to come here soon! Did you already think of an itinerary? Never heard of this before, but Bomarzo Park does look intriguing to me. 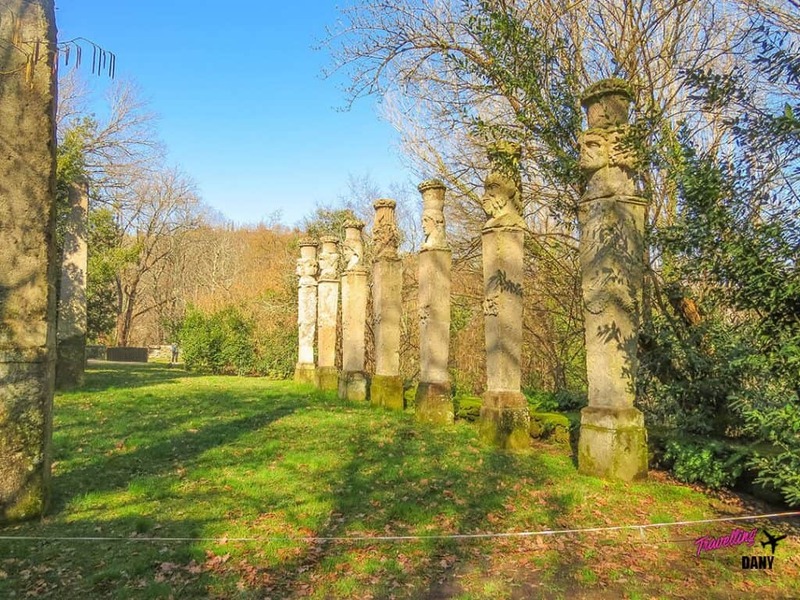 When I visit Rome, I’ll make it a point to take a trip here and its going to be easy, as you have mentioned all the essential information, one can possibly think of for visiting Bomarzo Park. It’s easier if you rent a car, actually, but it can be done using public transport provided you feel like walking a bit! What a brilliant place! I love how it was dedicated to his wife, but has some seriously spooky stuff there. And also how some of the menace is not overt; I had to go back and spot that the elephant was actually snacking on a person, as that totally passed me by on first look. This is absolutely the kind of place we’d visit (along with nuclear bunkers and the like), so thanks for sharing it in all its wonderfully odd glory. You got it! I also had to look twice on some statues, maybe because of the passing of time or because they were meant that way, but some of the spooky stuff was a bit hidden, you had to look at the statues harder to understand. Which is something we loved a lot! Oh wow, Bomarzo Monster Park is definitely off beat and interesting! Even if historians don’t fully understand the meaning behind the crazy statues, they’re still quite fascinating! 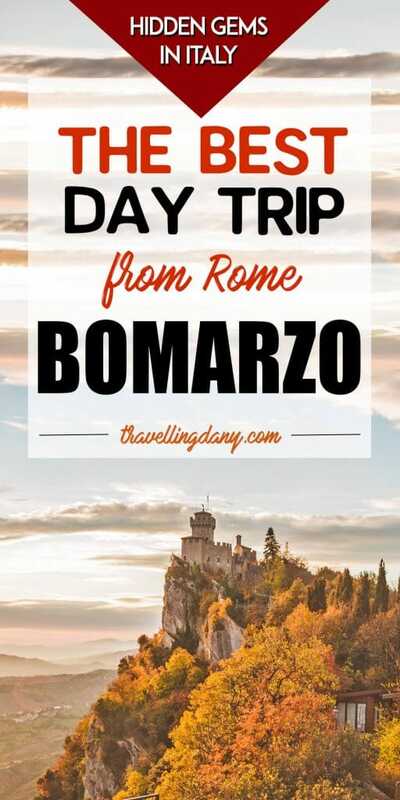 A really cool day trip from Rome for sure. How crazy!!! Thanks for letting me know! Whoa! Amazing creations! I am imagining the insta worthy pictures possible in this park. What a story behind the making of this park! A new addition to my dream list. I will be honest and say I’m not the usual “insta-girl” so I was more fascinated by the spooky legends than from the instagrammable places, but there were a good few! 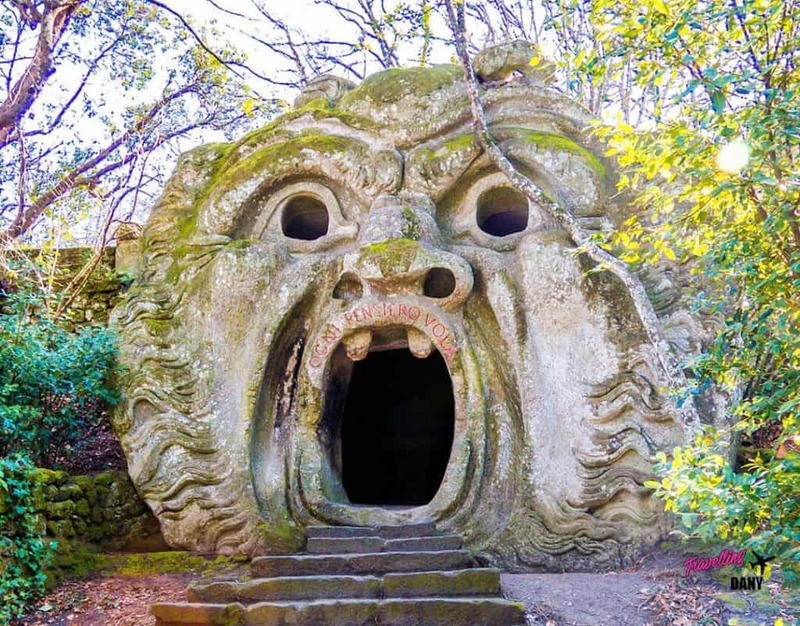 Whoa…I have never heard of Bomarzo Monster Park but I HAVE TO GO!! Darcee would love exploring this as she loves haunted sites and I love the “love story” so to speak behind the building of the garden. How totally bizarre are those statues yet eerily beautiful! You used the perfect words,they’re both scary and bizarre and beautiful. Definitely worth a trip, I bet Darcee would have a blast! Oh, hell yes! This is totally my kind of place. I might have jumped the fence to explore Spreepark in Berlin (shh, don’t tell anyone), and I love finding these kinds of abandoned amusement parks. I must have passed right by it when I was on my train from Rome to Florence a couple years ago. Yet another reason to get back to Italy. 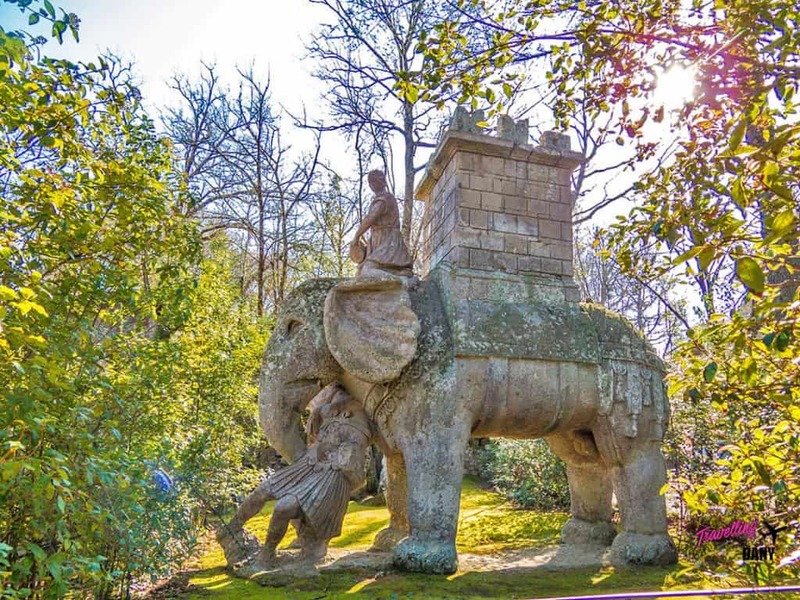 The Bomarzo Monster Park sounds like a fascinating place to spend a day, although you are right, driving definitely looks like a better option than public transport! I love how parts of the history are a mystery – such a strange idea to have grotesque statues in the sacred grove as a memorial to Vicino Orsini’s wife! I guess we’ll never know! I like to explore places like these. Never heard of this place before. Thanks for sharing. I spent 5 weeks in Italy last year, and I wish I had read this post! I’ve never heard of Bomarzo Monster Park before, and I would love it there (even with the ghosts and all ?). The Orc reminds me of a Spanish movie called ‘Pan’s Labyrinth’. This park truly is a unique place! Thanks for sharing. Ouch! But hey, 5 weeks in Italy is awesome, did you have fun? The Bomarzo Monster Park is pretty unknown also to Italians: when they see it the first time they never forget about it! And now that you mention it, you’re right about Pan’s Labyrinth!!! It might well be, the whole area is still an unsolved enigma! Italy is really high on my bucket list right now. 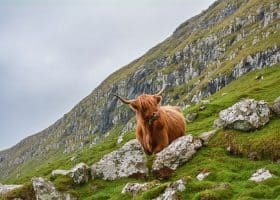 It’s not very often that we hear about off-the-beaten-track attractions in this country which never fails to allure tourists. While we may not fully comprehend the meaning of the Sacred Grove, it is certainly unique and has its own air of mystery. Stunning! I’ve heard of this place but didn’t know it was in Italy. What an odd, fascinating place. It’s definitely on my must-do list for next time I’m in Italy. Thank you for the great tips! Have you? Wow! It’s not well known, not even in Italy, but it’s SO fascinating! I spend a lot of time in Italy but haven’t seen enough of this region outside Roma! Bomarzo looks incredible and very mysterious too. I will definitely visit on my next return. I’m sure you’d love it, and how cool that you’re often in Italy!!! Oh wow! Will you only visit the Rome area? Wish I’d known about this place before I visited Italy last summer, drats! If I make it back to Italy, I’ll definitely add this to my list. What an oddly cool place! I love discovering random gems like this. Thanks for sharing! It would be fun to explore these figures and try to figure out the meaning behind them. My belief is that most of the carvings have a meaning or a message – you just need the right knowledge or right instinct to decipher them. Since you mention ancient signs, I am really intrigued. Same here! Unfortunately no one has still found the way to decipher the signs, but who knows, maybe in future! I definitely need to do this next time I’m in Rome; it looks so fantastical! Grazie mille! Prego! I’m sure you’d love it! 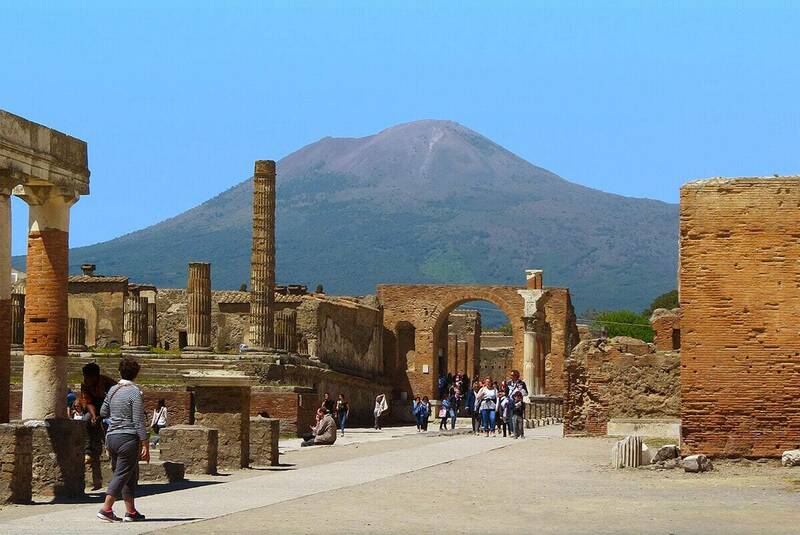 What an amazing looking place – and a great tip for a relaxing day trip from Rome. I’d love to visit -despite being scared of ghosts!!! I could feel the chill while reading this…damn good! I have never even heard of this place, but now I am so interested! I’ve been dying to return to Italy after a taste of the country 4 years ago and next time around I definitely want to hit up spots off the beaten track. This is now on my list. I much prefer the off the beaten track in Italy so I’m sure you’ll find a lot of awesome places to go to!